Pittsburgh has been described as many things but not what it is now - a really fun, photogenic place to spend a few days. I was surprised how much fun and so was everyone else who attended a recent conference there. We couldn't stop snapping pictures either. Here's a very short list to consider. I tried three ways - paddle wheeler, hop on-hop off bus and Just Ducky Tours - four if you count the Duquesne incline. Pittsburgh skyline from the double decker bus. The double-decker bus is good for getting the lay of the land and for sight-seeing later. The narration was fast and fun, thanks to a guide from Bristol, England. The riverboats of the Gateway Clipper fleet are hard to resist and Pittsburgh's rivers offer a totally different viewpoint of the city. Tip: There are 13 steps from deck to lounge and 13 more steps from lounge to the open upper deck where photographers will want to be. For fun and some really nifty shots, the amphibious Just Ducky Tour is a kick. Kids will like this one best and chances are so will their parents. You will tour both city and rivers and the kids get to steer for the river portion. Tip: There is one handicapped-equipped craft with lift. For Levelers, it's eight steps up to the boat, two steps down to the covered seating area. 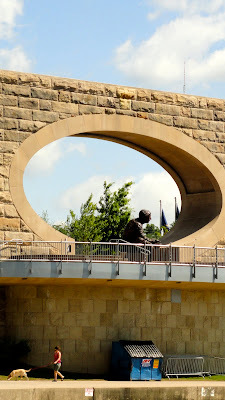 Whichever one you take, you will learn about the city's three identical bridges, named for Pirates great Roberto Clemente, native son artist Andy Warhol and native daughter author/environmentalist Rachel Carson, and a lot of other Pittsburghisms. Downtown Pittsburgh from the Lucky Ducky. 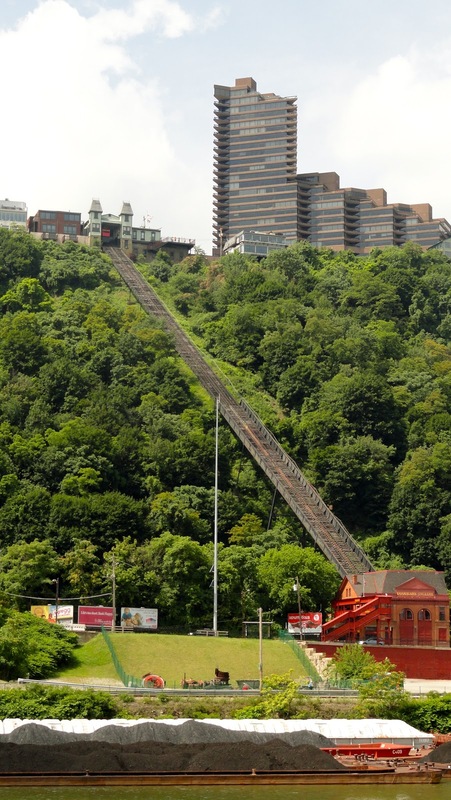 The Duquesne Incline, originally built in 1877 to get workers from the top of Mt. Washington to the factories and back, is on most natives' Must-do lists, but Levelers may want to think twice. Warning: On the city side there are 35 steps up from the parking lot to street level (no stopping on the busy thoroughfare) and another 28 steps up to the overpass then 8 steps down to the station. Which you will have to repeat upon the return unless you have someone pick you up or drop you off at the top where the station is at street level. Meeting of the rivers seen from atop Mt. Washington. The views are spectacular on a clear day - they say even more so at night - and the history lesson you get on the city's early days is interesting but if steps bother you, save your energy for something else. A Chihuly just like Mother Nature would make. 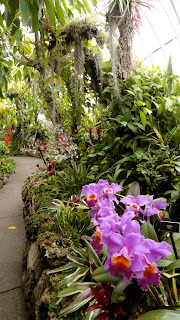 Like a walk through the Phipps Conservatory and Botanical Gardens for example. 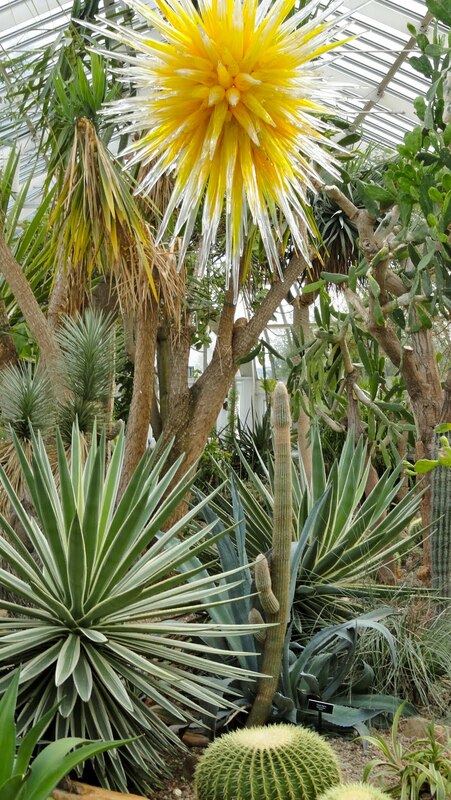 From creative uses of foliage to themed rooms, a kids' interactive area and tropical rainforests, this is a horticulturist's dream even brown thumbs will enjoy. Tip: Short stairs, easy ramps, elevators and benches make this pleasant for Levelers. 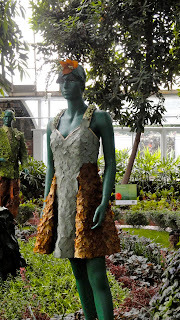 Mannequins wear foliage at the Phipps Conservatory. 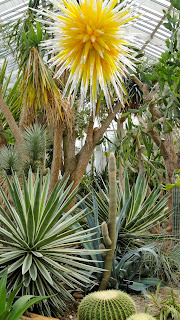 A Chihuly sun or cactus? 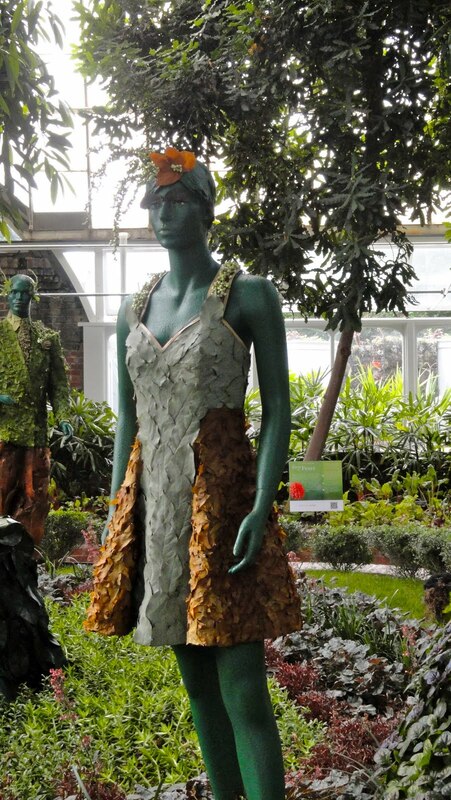 See it at the Phipps. Art lovers will appreciate the Dale Chihuly glass sculptures that look right at home among nature's exotic blooms. 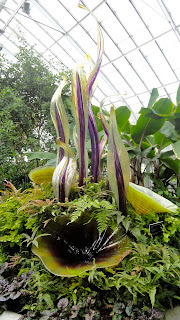 There's a massive Chihuly chandelier in the entrance but I much preferred the ones peeking or thrusting out from the leaves and stalks. The orchid "room" is pretty spectacular, too. 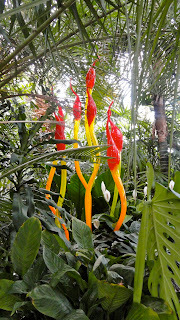 Chihuly makes a Peace Lily form on brilliant steroids. Orchids at the Phipps Conservatory. Kayak Pittsburgh will put you at the water's edge literally for an up close and personal cruise through the city's rivers or around its lakes. The Steps are a great playground. Walk the Rivers Take advantage of the wide, mostly paved paths along the river and ramble along the shore for a bit. If you have kids in tow, don't miss "the steps," a kid-friendly waterfall playground just down from Mr. Rogers' statue and neighborhood. 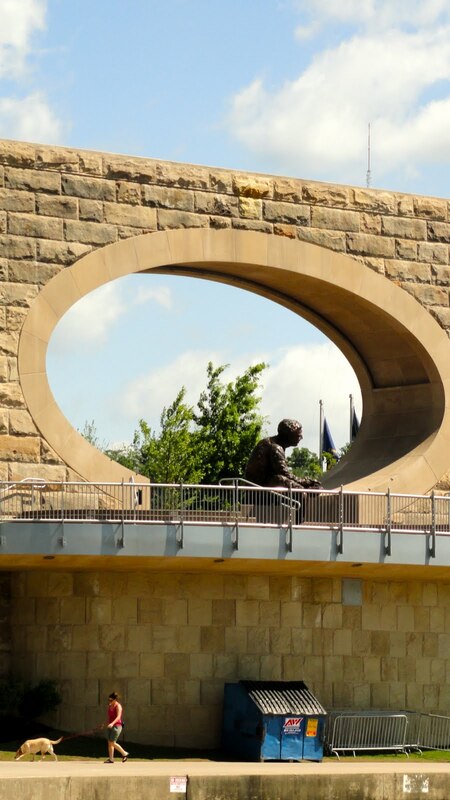 Pittsburgh is Mr. Rogers' neighborhood. Heinz Field, home of the Steelers. Take in a game. Between the Pirates, the Steelers and the Penguins, pro sports are a year-round treat in Pittsburgh. Visit Lady Luck. She'll be at The Rivers Casino 24 hours a day. Then there's the Zoo and PPG Aquarium, the Kennywood Amusement Park, Trolley Museum, Senator John Heinz History Center, Carnegie Science Center, Children's Museum, August Wilson Center for African American Culture, Frick Art & Historical Center and The ToonSeum. Just to name a few. On second thought, make that visit at least a week. Pittsburgh, a city of rivers and bridges. Travel to Pittsburgh, PA and you'll find a clean, stylish city full of rivers, art, sports, ethnic food, neighborhood bars, beautiful vistas and fun things to do. Most of it is reasonably priced, easily accessed and relatively flat. That's the good news. The bad news is, or so I'm told, that Pittsburgh is the cloudiest of U.S. cities. Couldn't prove it by me; I came home with a sunburn. Monongahela and Allegheny Rivers converge to make the Ohio River . Water views are everywhere and so are bridges because the meeting of the Monongahela and Allegheny Rivers to form the Ohio River created a city with river fronts of six sides. Walkers and cyclists share the trails that line them and kayakers share the rivers with canoeists, amphibious tour vehicles and paddle wheelers. 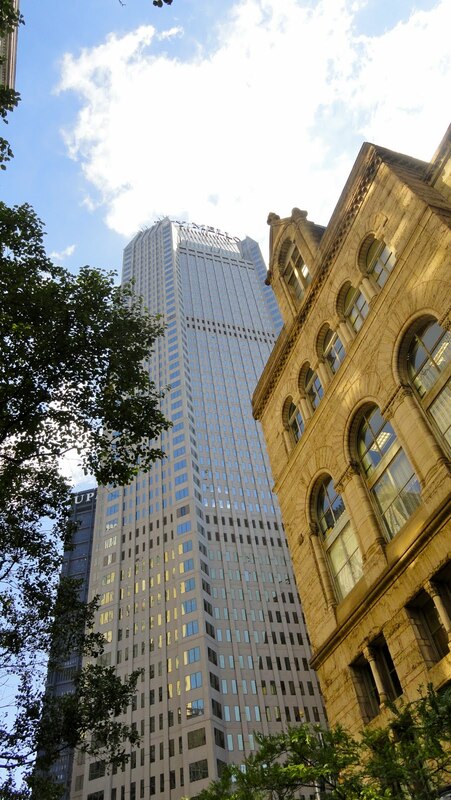 There are many hotels in the downtown area and if traveling green is your goal the Fairmont Pittsburgh should be your destination. Food is locally accessed, solar power is in play and they even make their own soap. A conference took me to the Sheraton Station Square across the Monongahela River from the triangular city core and anchoring one end the Station Square development. The hotel is showing its age but the staff is friendly and best of all is the free shuttle van that will take you almost anywhere within the downtown areas. 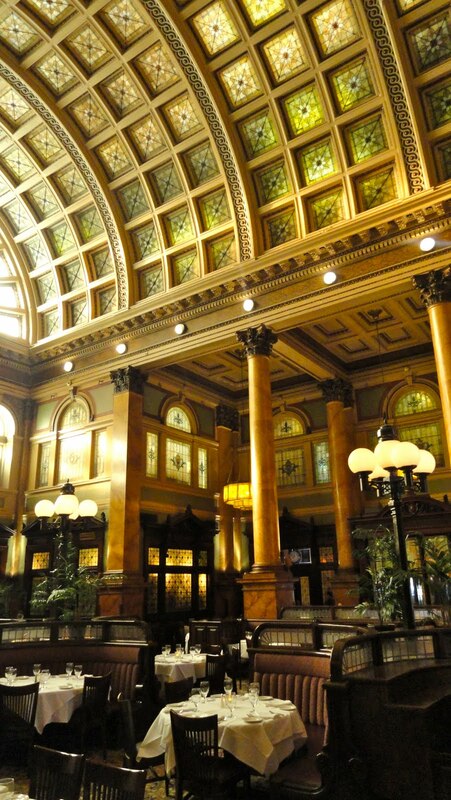 Grand Concourse is an elegant spot for dining. 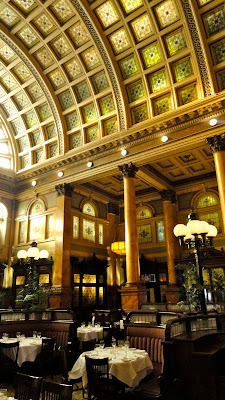 Station Square is pretty touristy in the middle, with chain eateries - Buca di Beppo, Hard Rock Cafe, for example - but at the other end a short, flat walk away is the historic, quite beautiful and very good Grand Concourse, an elegant old train station where the city's best Sunday brunch is served. Good lunches and dinners the other days, too. Gandy Dancer is the more casual dining area; there's an oyster bar, too. I'm sure Pittsburgh has other superb upscale gourmet restaurants, but for memorable meals under $10 head to "the Strip" for breakfast, lunch or an early dinner. This rectangle of deliciousness along Smallman Street, Mulberry Way and Penn Avenue, between 16th and 23rd Streets is filled with a farmers' market, souvenir stands and boutiques, flower shops, purveyors of fine chocolates and coffees and best of all, one ethnic restaurant and grocery store after another. You can travel around the world on the aromas alone. Here are a few stops to get you started. 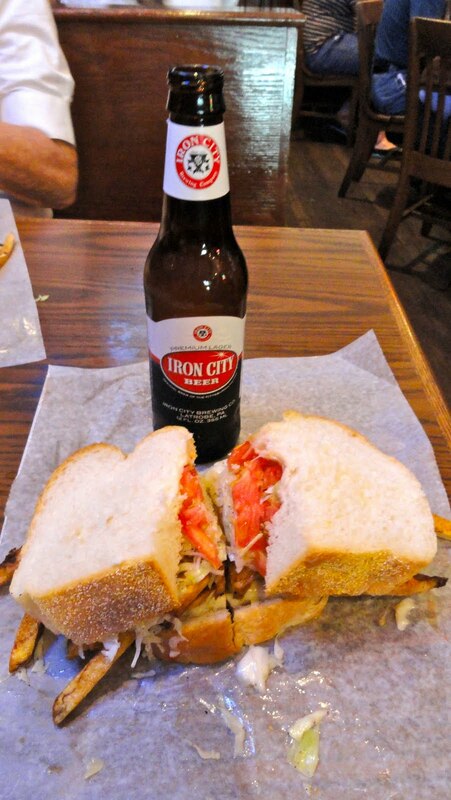 Everyone will insist you have a Primanti Bros. sandwich. What was a hard-working man to do when his lunch hour was too short for a real meal? He ate one of these - meat of choice, cheese, coleslaw and french fries piled high inside two slabs of Italian bread. Today, with a bottle of Iron City beer, $9.62. A real two-fisted sandwich. Tip: The bathrooms here are down 11 steps. Pamela's P&G Diner is where the Obama family heads for breakfast or lunch. Choices are many but most come for the crepe-style pancakes. The Lyonnaise potatoes and cole slaw are popular too. Most expensive things on the menu are salads at $7.95. 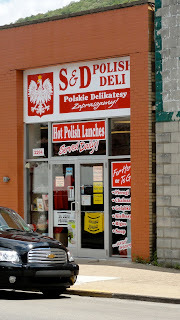 Anxious to try a pierogi, I had to go to the S&D Polish Deli. Light as a feather dough filled with a delicate mixture of cheese and potato and generously dabbed with butter, it was the highlight of my Strip experience. The back of this small grocery is filled with tables and I plan to sit at one some day and eat my way through the whole menu, from 4 for $4 pierogis to the $5 pork stew over potato dumplings. Toward the northeast end of the Strip, an older Asian woman at a cart was whipping up Vietnamese hoagies - freshly grilled meat and veggies piled into a roll, splashed with sauce and wrapped in foil. Yumm. Klavon's, way down on the corner at 28th Street, is the type of ice cream parlor your parents remember and I recall vividly from the late '40s because my father had one. Pressed tin ceiling, bent ice cream chairs and booths, a marble counter with stools and behind it the classic pale green Waring blenders for milk shakes and malteds. The ice cream was so-so (it had ice crystals, a sign of melting and refreezing and a real no-no for connoisseurs of which I was one by the age of 8) but the atmosphere was sublime. An 11 (!) egg omelet? Also notable, The Church Brew Works, Lidia's (of TV fame) Pittsburgh, DeLuca's, home of the 11-egg omelet and enough aromatic Greek and Italian grocery stores for a lifetime of carbs and calories. To wet your whistle, head for Carson Street where you will find 101 drinking establishments in 15 blocks, something of a record, I believe. Next posts: What to Do, the Cultural District and Pittsburghisms. 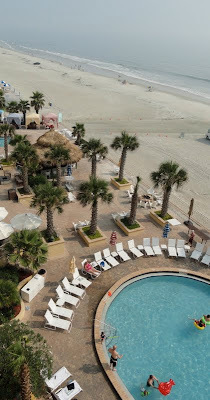 The Shores Resort & Spa - Daytona's best? The Shores Resort & Spa in Daytona Shores is definitely a cut above what most tourists experience in the Daytona Beach, FL, area. I'm tempted to say it's the best - it's Daytona's only AAA Four-Diamond luxury beachfront hotel - but I haven't personally stayed at them all. 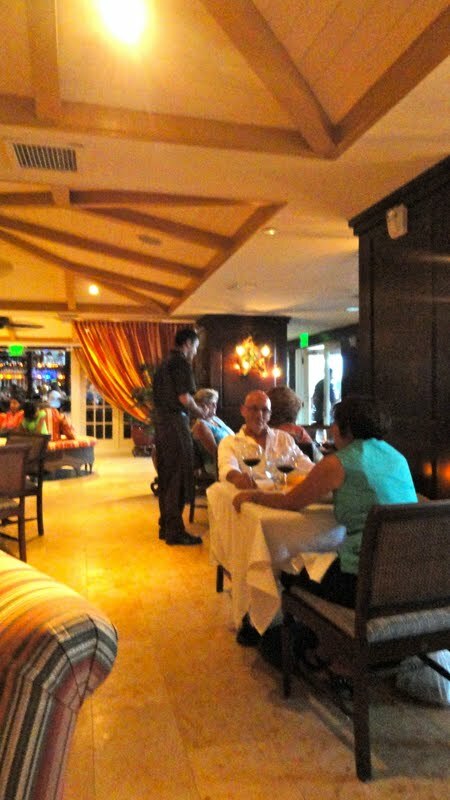 I do know that it's a great place for Levelers - barely a step in sight - and the food is outstanding, a real surprise. Tip: If you select a ground level pool room - very popular with multi-generational families - you will have five steps from pool to your room's terrace. All ages enjoy the nightly S'mores splurge at the beach-side fire pit. Inside, the lobby is club-like with dark wood paneling, a spacious center with round ottoman-style seating, two-person chess, checkers and backgammon game table and comfy conversation niches along one wall. The second floor spa is also an unexpected pleasure. Their new Bamboo massage takes the hot stone technique and broadens the areas of pressure with warmed bamboo "rollers" of varying circumferences. Lots of aahs, believe me. Outside, the large pool and surrounding deck is always active, from cabanas and lounges to the bar and dining areas. Tip: Kelly, pool man supreme, will take very good care of you. He may look as if he never eats but take his word on food recommendations; the man knows. The grilled cheese sandwich is the best ever and worth clogging an artery or two. A friend and I were hosted by the hotel for one of the chefs' popular Wine Dinners at Azure, held the third Thursday of each month (except August when they take a break). I've been to a number of wine dinners and either you leave with a blur of flavors and wines or with an urge for something substantial and singular in flavor like a hamburger. Not here. My taste buds still vividly recall the textures and flavors of each course, (there were four) including the wine. Each dinner has a theme; ours was a summer grill, perfect for the June Florida climate. From the opening Grilled Fennel and Peach Brochette to the Char-Grilled Atlantic Swordfish with Blood Orange and Thai Basil Salad with Summer Vegetable Couscous and the outrageously rich as satisfying dessert, the meal was a winner. Also organic and sustainable, a theme that followed through with the Benziger family wines. Even better, the wine dinners are $45 per person, a far cry from much less satisfying but much more common $100 a plate fare. Tip: You can read more about the courses and wines, plus get the recipes in the coming weeks at my other blog, Food Afar - Recipes from a Travel Writer. In short, if you want the fun of broad beaches, an ever-changing ocean and Daytona's speedway with an ample serving of luxury and almost no steps, The Shores Resort & Spa is the place to go. My friend, also a Leveler, loved it summed up the experience with a comment on the staff's attitude, "No one looks through you here." Yes, I'm patting myself on the back but what else is called for when a post from this blog is judged best of all? Travel on the Level's blog postings on Germany took first prize in this year's writing and photography contest sponsored by the Atlantic Caribbean chapter of the Society of American Travel Writers. In case you missed them, the series of posts covered my trip across Germany's waist and ran here October 29, 2010 through Dec. 28, 2010. My other blog, Food Afar - Recipes from a Travel Writer - placed third. Enough already. Back to normal with lots of posts to come on wonderful Pittsburgh, the beautiful Laurel Highlands and Frank Lloyd Wright's amazing Fallingwater.